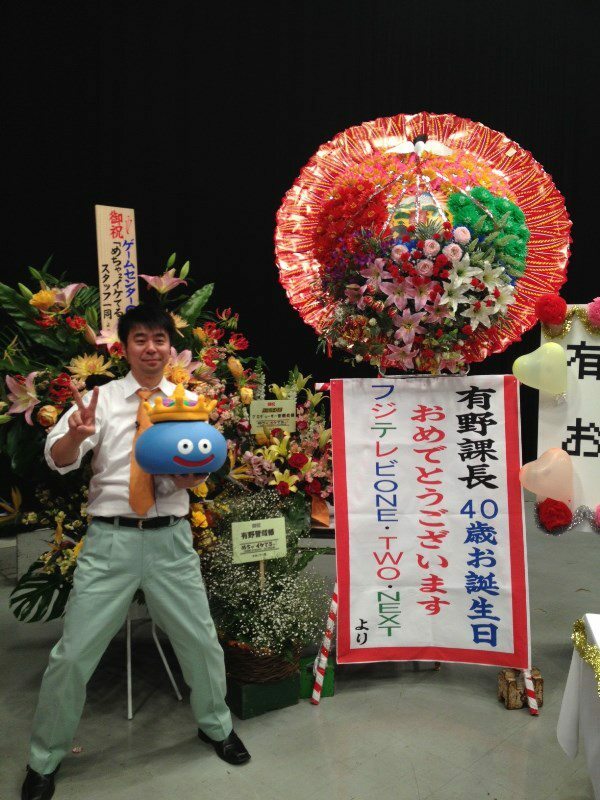 Arino celebrated his birthday on February 25th. Many English speaking fans took to twitter to wish the Kacho happy birthday. 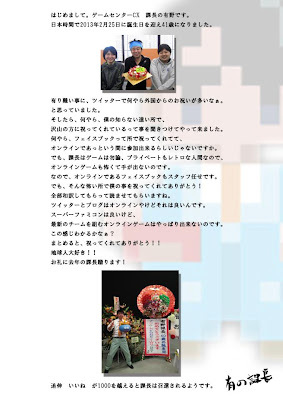 In response, Arino responded to the Retro Game Master facebook page. It is very nice meet you everyone, this is Arino, the Kacho of Retro Game Master (a.k.a. Game Center CS). I became 41 years old Kacho on February 25, 2013, Japan time. Thank you all enough to send me a message via twitter. I was just wondering why I am having so many english tweet from overseas, but I heard there were a lot of people "here" on this page to celebrate. I am really happy to hear people are celebrating my birthday without my reach. Obviously, Facebook is easily accessible in a minute, scary! Me myself is as Kacho and as my private life, I am a "retro" human being, so I am so scared to dig into online-game world. So, Facebook is out my reach too, and everything has been done by our staff. I still like to thank you for everyone who lives in such a scary net world. 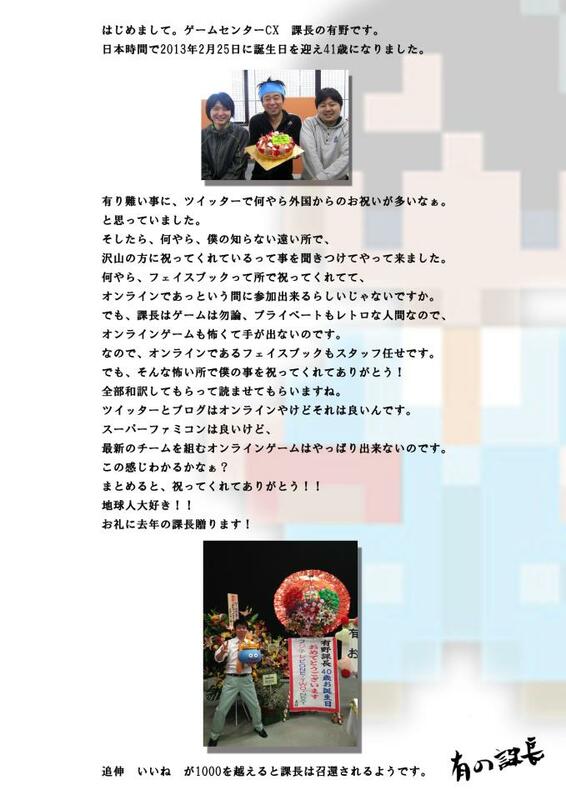 I will ask my staff to translate every single message into Japanese and I will read it all. Twitter and Blog are on-line as well, but I would accept it. Super Fami-con is acceptable, but I can't do on-line game. Does anyone understand how I feel about this? In conclusion, THANK YOU SO MUCH FOR CELEBRATING MY BIRTHDAY!! I loooove earthmen!! To show my gratitude, here is a photo from my 40's birthday last year. P.S. Every time the number of LIKEs here reaches 1,000, Kacho will come. Signed by Arino, the Kacho.